Let your spirit take wing at Eagles Ridge Cabin. Stars twinkle over glowing embers in the fire pit. Don't forget marshmallows! Enjoy fresh mountain air on the screened porch. Come and enjoy the peace and quiet at Eagles Ridge Cabin. You can relax on the rockers on the 65-ft. front deck as you take in the view of the mountain ridges and the valley below. Relax as you watch the clouds pass by beneath you and be sure to take time to view the beautiful sunrises and sunsets. 4 Bedrooms and 3 Baths. The first bedroom on the main level has a King bed and private bath with a stand alone shower. The second bedroom on the main level has a queen-size bed. There is one full bath with a standalone shower stall on the main level with the kitchen and living room. The lower level with the game room and sitting area has two additional bedrooms and a full bath with a tub and shower combination. The Third and Fourth bedrooms each have queen beds. There are two sleeper sofas- one in the game room area and the second is in the lower level sitting area. The large screened porch can be used for dining, entertaining or as a place to sit and watch the birds, butterflies and other wildlife. You can tell stories and make s’mores around the fire pit at the edge of the yard. And be sure to take advantage of the hot tub at the end of each day. Eagles Ridge is ready and waiting for your visit. • Wireless Internet Able to stream movies on your devices. Each year, our group heads to the mountains for some golfing, shopping, Biltmore and adventures. 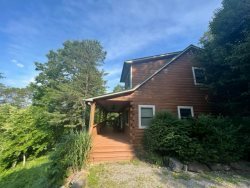 This is the third year that we booked with Great Smoky Cabin Rentals and we will do it again. Each time we have had a different cabin and have never been disappointed. We really liked Eagles Ridge Cabin and are looking to book it again. It has comfortable beds, a large kitchen and screened in porch. The views are breath taking and the fire pit warmed us at night. Once you see the views, you will understand why it is called the Smokey Mountains. They had all of the amenities (hair dryer included) that you would need. The only draw back was no internet. We did have a wireless card, but the signal was weak most of the time. We can't wait for fall again! Great Smokys Cabin Rentals helped us select this cabin and it was everything they said it was. When we arrived, entry lights were on, cabin was cooled down, and the hot tub was ready! Eagles Ridge is a great place for a large family or 4 couples! We found this cabin high up on Baines Mountain to be the ideal place for our church social group of 4 couples. All bedrooms were very comfortable and the great room was super! Kitchen and Dining area was large enough to accommodate the 8 of us, and the outdoor screen porch/deck was a bonus for us. Mountain views were great and only minutes from downtown Bryson City. Just be prepared to navigate a narrow but well maintained mountain road to the cabins in that area. Will probably go back again next year. Manager Response - Sep 24, 2013: Thank you so much for the great review of Eagles Ridge. We are delighted to hear that your church group had a great time and the cabin was everything you were looking for when you booked with us. We strive to make our cabins comfortable and inviting. Remember when you come back next year to ask for your repeat customer discount of 10%. Had a Great time. Cabin was great and plenty of room for 9 people. Loved the screened porch. I can't think of anything that was not provided we were amazed. This was a family reunion vacation after over 20 years of being apart. I picked the perfect place for it. There was lots of space for everyone and I can truly say this home surpassed every expectation and then some that each of us had imagined. We definitely would like to come again. We had an amazing week 30+ family members in 6 cabins a long Baines Mountain. By far Eagles Ridge was the best!! Thank you for allowing our family into your beautiful home. Waking up in the mornings & watching the sun come up amazing views. The hot tub and the fire pit were in the evenings the comfy bed and a great nights sleep is just what this grandma needed. Leaving will be difficult but we will definitely be back. Our God certainly knew what he was doing with this perfect creation of the mountains. What an incredible place to sit and reflect. The view is breathtaking and so much to do cabin was perfect for our little family. We will be back in 2014. Thank you for having us to your beautiful house for a wonderful weekend. Elle enjoyed her 2nd birthday cake and Craig enjoyed his 40th birthday cake as well. Can't wait to come back and spend more time with the family. Wonderful view of the mountains. The hot tub was awesome. Great accommodations. Had a great time. We got there when it was still daylight. We had an awesome time and look forward to staying there again. It was absoloutely breath taking. Thank you for helping us find the perfect place. Absoloutely beautiful. We had such a fantastic time. I wish we could have stayed longer. Maybe we can rent it for a week next time. Our family has always loved the Great Smoky Mountains since I was a little girl.